On Friday 1st November 2019, we will be hosting a Day of Special Interest at The Warwickshire Golf & Country Club, Leek Wootton, Warwick CV35 7QT. 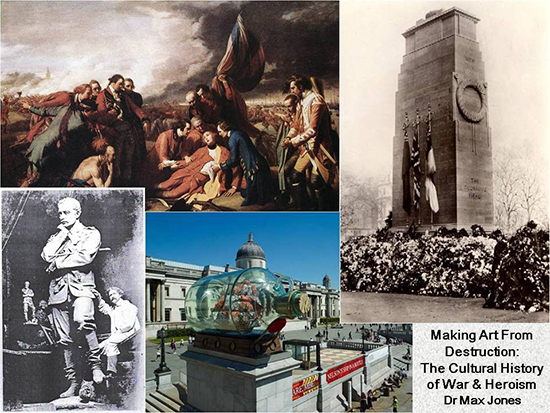 The speaker will be Dr Max Jones and the subject will be, “Making Art From Destruction: the Cultural History of War and Heroism”. How have British artists responded to the destruction of warfare? In this “Day of Special Interest”, we will explore the changing ways in which artists have interpreted war and heroism over the last three centuries. Attention focused on commanders through the eighteenth and nineteenth centuries – Wolfe, Nelson and Wellington, Havelock and Gordon – as sculptors and painters raised a host of Admirals and Generals onto pedestals. Paintings and monuments presented death in war as heroic sacrifice. The unprecedented destruction wrought by the First World War put these artistic conventions under pressure. Six million Britons served in the armed forces during the war – one in eight perished. The legions of the bereaved launched a wave of commemorative projects, erecting thousands of memorials which still mark the landscape today. We will explore how artists developed new strategies to represent loss and honour the dead of the war. Some artists experimented with abstract forms, with Trafalgar Square’s Fourth Plinth emerging as a major national site for artistic innovation in the twenty-first century. Yet established conventions of commemoration and celebration have endured: classical motifs and figurative forms remain central to the art of war and heroism. Dr Jones is Senior Lecturer in Modern History at the University of Manchester. He has a BA (Hons) from the University of Oxford, an MA and C.Phil from the University of California at Berkeley and a PhD from the University of Cambridge. He is also a Fellow of the Royal Historical Society and a Fellow of the Royal Geographical Society. He regularly speaks about his research to public audiences throughout the UK and beyond. He believes that, "the audience should leave the theatre feeling that they’ve participated in a unique event, shaped by the interaction between the lecturer and the audience. Never simply read out a prepared script". The cost of the day will be £42.00 which will include lunch. Tickets for this event will be on sale at the September and October lectures. The lectures will begin at 10:00am and the day is expected to end at about 4:00pm.